Inverse Square tries hard not to be a political blog; my gig is connecting something of science — a story, an approach, maybe just a concept — to the public square. So I won’t write today anything about yesterday’s elections. There’s plenty out there, better and wittier and more comprehensive and all that. But check out Cole’s picture; it truly does say what needs to be said as economically as you can imagine. Then read the rest of the post. It nails the central issue for next six months. If it isn’t Cole’s best work, it’ll do till something better comes along. Carthago The contemporary GOP delenda est. 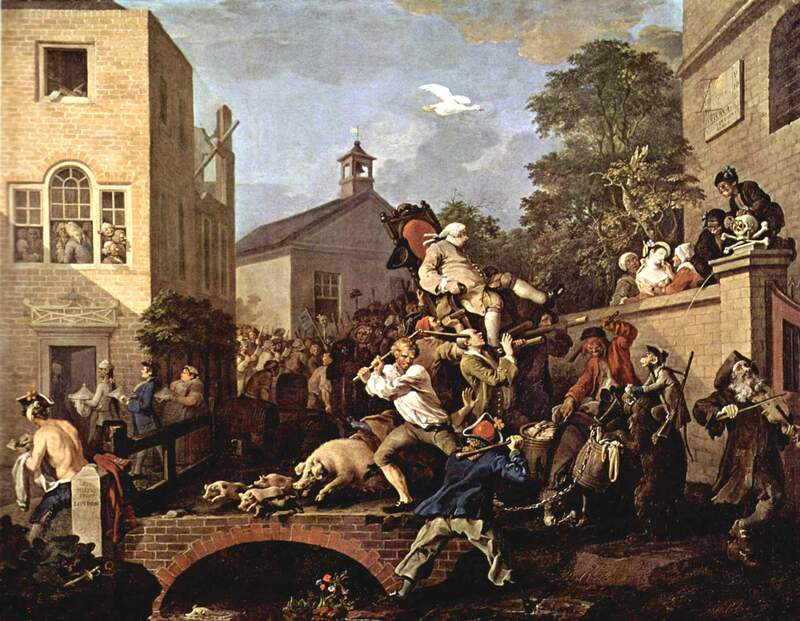 Clinton, Canute, and a Certain Gravity. But the jump the shark moment — or perhaps the most recent leap in the 400 meter shark hurdle race — has to be this. Senator Clinton, perhaps recently bitten by a radioactive spider, has decided that she now has the mojo to break up OPEC. Great idea! Why didn’t anyone think of that before? But to pick up on Josh’s take, I’m given to understand that the next target of the growing anti-elitist lobby will be the law of gravity. However, even were Senator Clinton to add her voice to the chorus of disdain for Isaac Newton, Albert Einstein and other such out of touch eggheads, this issue has in fact already been put on the table. Ah well. It will all be over soon. 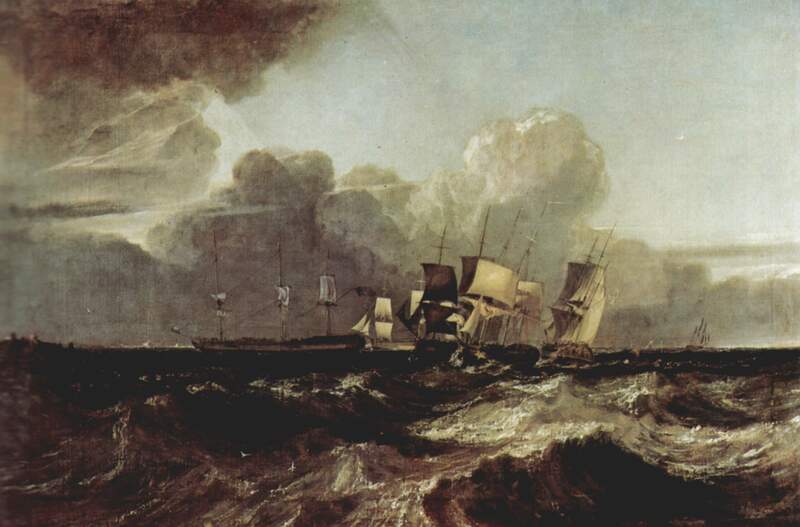 Image: J.W.M Turner, “The Sea at Egremont,” 1802. The work of art depicted in this image and the reproduction thereof are in the public domain worldwide. The reproduction is part of a collection of reproductions compiled by The Yorck Project. The compilation copyright is held by Zenodot Verlagsgesellschaft mbH and licensed under the GNU Free Documentation License. Source: Wikimedia Commons. The blogosphere has been all over Hilary Clinton’s bizarre, preposterous, and just plain awful defense of the gas tax holiday nonsense to which she has, seemingly, attatched the last shred of her hopes of winning the nomination. See John Cole for his customary clarity and — how to say this…– precision guided rhetoric. The Carpetbagger (Steve Benen) is on the case; so is Matthew Yglesias … and best of all, Brad Delong channels Robert Reich to drive a stake through the heart of Clinton’s latest. I’m not going to put my lot in with economists, because I know if we get it right, if we actually did it right, if we had a president who used all the tools of the presidency, we would design it in such a way that it would be implemented effectively….You know, it’s really odd to me that arguing to give relief to the vast majority of Americans creates this incredible pushback…..
We’ve got to get out of this mindset where somehow elite opinion is always on the side of doing things that really disadvantage the vast majority of Americans. There are two things that jump out of the quote. First, it is incredibly muddled or rather, actually more than a muddle. Clinton here depends on an obvious contradiction: she doesn’t trust elite opinion, but she will need elite-level policy design and implementation to give the idea even a remote chance of working. Sorry — it’s one or the other; expertise or failed policy…but not both. That’s one. The other, broader implication is that we actually just held the long hoped for science debate — and the winner is clear. I’m going to blog this week on what John McCain’s publicly announced budget plans mean for science (nothing good, and actually worse than that) — and I’ve already taken whacks at a few of his more obvious gaps and loopiness on more or less scientific topics. There is nothing in his record or in the statements McCain has made on the campaign trail that suggests that he has made the connection between scientific research or the critical thinking scientific training inculcates and the economic health and national security of the United States. He lost the science debate long ago. But what of Hilary? Up until recently, she hadn’t been doing too badly. She, like McCain and Obama, have wavered on some things – all three have fallen into the peculiar trap of waffling on the autism/vaccine issue, for example — and all the criticism I and many others showered on McCain on this one falls to the other two as well. But broadly speaking, judging by the issues papers on her website, Clinton has maintained a fairly sophisticated approach to global warming and applied research, with the implication that the policies near and dear to scientists’ hearts — more money, and even more important, respect for the real knowledge developed within by scientific process, would flow under a Clinton presidency. What Clinton provided for public consumption may be boilerplate, but it has been good boilerplate. But now, what she said at the Indiana interview this morning changes the game. She said, in effect, if the smart boys and girls don’t agree with her, then to hell with them. That is, of course, precisely the anti-rational madness that has dominated the George Bush years. It is inimical to science or a scientific world view. If we are to pick and choose the facts we like, it is a very short step, quickly taken, to making them up. And that way lies an ever more rapid collapse of the American republic. Science won’t care. Nature doesn’t care. People will still do the work, because it is interesting; it is useful; it satisfies personal needs and passions and responds to a seemingly universal human eagerness for knowledge. It’s just that there is no natural law that requires that the leading edge work be done here. Even if it does, if we can coast on the accumulated intellectual capital we still possess, there is no guarantee that it will be allowed to inform the way we live here. We can lose the extraordinary benefits of generations of world scientific leadership surprisingly quickly — and announcing that you will ignore the advice of experts when it pleases you is a pretty good way to grease the skids for such a decline. Barack Obama is no perfect paragon — the vaccine stuff is a relatively minor demonstration that he can pander too, soothing a passionate pressure group despite overwhelming expert advice. He is, after all, a politician, a very good, a very compelling one. I’m willing to bet that he’ll find times when the inherent uncertainty in science gives him useful cover for the lesser but more popular choice. But on the gas tax holiday he has been exemplary. He recognized the flaws in the idea — from the fact that it won’t work, to the realization that even if it did work precisely as designed it’s still the wrong policy to pursue if you take the issues of energy independence and global warming seriously. He’s said so in a range of ways and places, and he has taken the trouble to explain the subtleties of his position. That’s the way a president who can hear advice talks. And that capacity is what American science needs more than any particular policy stance. We may not have had our science debate in any formal sense — but on the gas tax issue, our candidates have managed to perform a reasonable simulation of one. And as I said at the beginning, there is one clear winner. 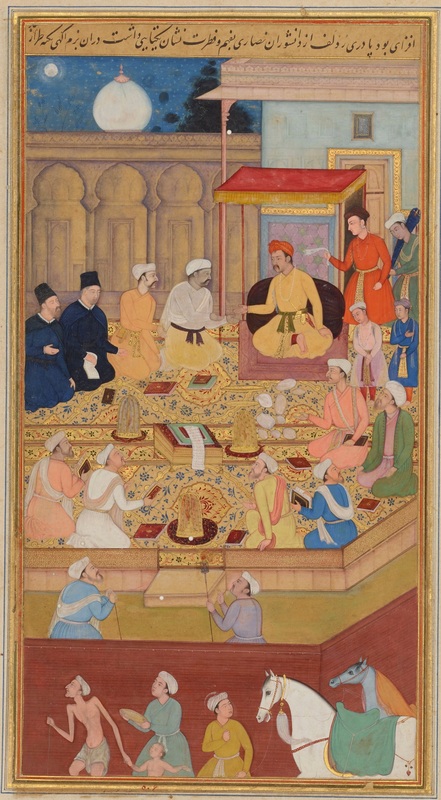 Image: Nar Singh, “Jesuits at Akbar’s Court” illustration for the Akbarnama, c. 1605. Source: Wikimedia Commons. Categories: bad ideas, climate, Climate follies, Clinton, Economic follies, Energy follies, McCain, Obama, Politics, Science Policy, Sharp thinking, Stupidity, Uncategorized, Who thought that was a good idea? Really Stupid Ideas: Hillary update. Matthew Yglesias has a more subtle take on Hillary’s “me too” on McCain’s gas tax holiday folly. He points out that Obama’s principled rejection of the obviously stupid idea is correct on the merits, but bad politics in an arena where the religion of tax cuts still holds sway. His close reading of Hillary’s apparent support for McCain’s environmentally and economically foolish proposal suggests that she does not in fact have any desire to see such silliness turned into law. Rather, he points out that she includes a careful, devastating qualifier in her support: that the holiday should only be enacted if the money thus lost to the Highway Trust Fund could be made up. As she (and everyone else) have suggested no way the funds could be magicked from some other source, this amounts to a rejection of a proposal she can get the credit for supporting. I buy that. I even buy Matt’s view that this is the smart politics. But at the same time, Clinton is still giving McCain cover: the underlying fact of the matter is that a gas tax holiday is incompatible with a commitment to take climate change seriously. To simply ignore the ignorable (as this proposal is, at least for the upcoming summer) allows the ongoing national self delusion to persist. If we truly think that global experiments with atmospheric change are a bad idea, then we have, among much else, to burn less gas. When Clinton says “sure — as long as we’re fiscally responsible” — she keeps climate change where it has been for the last eight years: off the table. 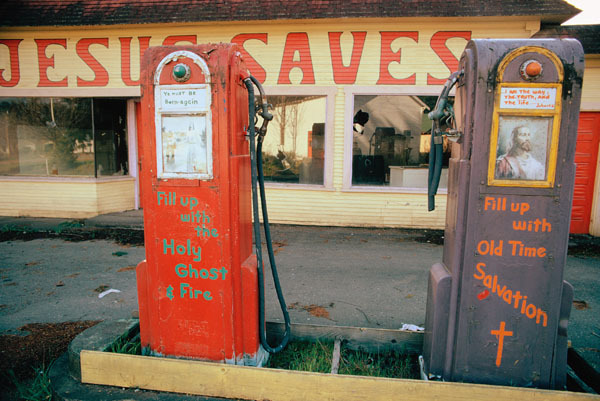 Just imagine, now, the counterfactual: suppose Clinton had said that she supported the gas tax holiday — as long as we came up with an offset for the carbon thus released. Categories: bad ideas, cars, Climate follies, Clinton, Economic follies, Energy follies, McCain, Obama, political follies, Politics, Stupidity, Who thought that was a good idea? Just to provide yet more real-world evidence of the vapid stupidity of McCain’s gas tax, now endorsed by Clinton, here, via Atrios, comes confirmation of the fact (surprise! ), that price affects consumption. That’s the market in action, folks. Doing what it should. Is there a problem here? John, Hilary: pay attention. Good on ya’ Barack for figuring this out. 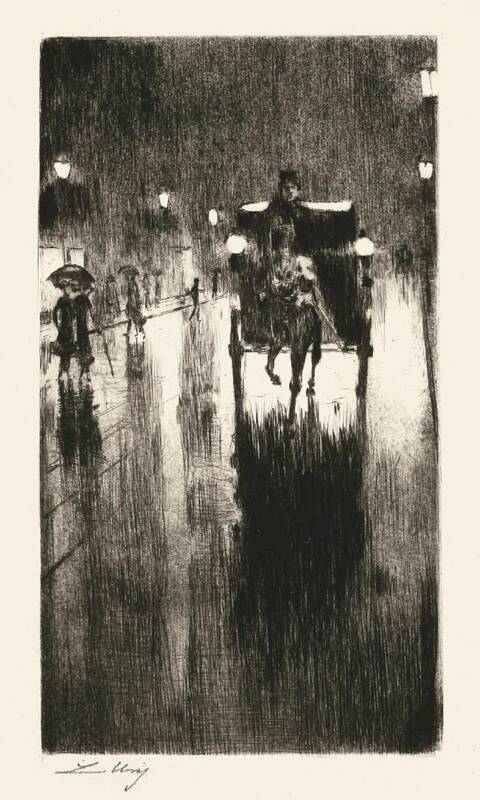 Image: Lesser Ury, “Hackney in Rainy Weather, (Pferdedroshke im Regenwetter),” 1924. Source, Wikimedia Commons. Really Stupid Ideas, take two: Hillary Clinton edition. In this post, I tried to lay out why John McCain’s idea (sic) for a gas tax “holiday” (now there’s an Orwellian usage). Short form: the holiday would save, on average 28 bucks per person; would cost jobs in the construction business (the gas tax supports the highway trust fund, which pays for road construction and repair), damage our infrastructure — and, as a lagniappe, would further damage any US attempt to address carbon pollution and climate change. (See the first post for links). except, of course, it doesn’t. Because today we learn that McCain has company: Hilary Clinton. All the reasons that a suspension of the gas tax is dumb, dumb, dumb apply just as much when the support comes from a me too Democrat as it does when it pops out of a clueless Republican. Barack Obama, to his credit, sees the idea for the harm-causing gimmick it is, and rejects it. In many ways, Hillary’s endorsement of McCain’s folly is worse than the original silliness. She is not a policy idiot. She has to understand the immediate and long term economic harm that flows from this. (You don’t fix infrastructure, it costs a ton in difficult to measure ways — everything from blown tires and busted shocks from pot hole interactions to the loss of time (money) that comes when deteriorating roads can’t handle the traffic load.) And above all, she says she takes global warming seriously. Check out her proposals here. She may not mean it, of course, just as McCain quite probably does not. The gas tax suspension has been proposed for this summer when, as you may have noticed, neither of the two candidates will actually wield any executive authority. This could well be one of those “how dumb do they think we are?…Pretty dumb” campaign trial balloons, to be forgotten the moment real governance begins. Strangely, that doesn’t make me regard either John McCain or Hillary Clinton more kindly. For further comment, see Virginia Postrel’s on point asperity here. (h/t Andrew) You can follow her link to Stephen Postrel’s quickie analysis of carbon tax vs. cap and trade economics here. S. Postrel falls into a familiar smart guy trap of opining about stuff he doesn’t actually know when he sneers at the state of climate science. (See Eric Roston’s incredibly generous review essay about my twenty year old book on the subject for context). (And hey — if we couldn’t blather about stuff we barely understood, where would the blogosphere be?) But that aside, he’s put together as clear a brief primer as I have yet seen on the economics of carbon regulation. Update: John Cole can’t stand the idiocy any more either. Shorter and funnier than me. Image: Public Domain. Source: Wikimedia Commons. Categories: bad ideas, Climate follies, Clinton, Economic follies, McCain, Obama, Picking sides, Politics, seriously, Stupidity, weather, Who thought that was a good idea?